U.S. Federal Route 166 runs east-west in Kansas. In Kansas, this highway is located in the southeastern portion of the state. The western end of U.S. Rt. 166 is at South Haven. Info on U.S. Rt. 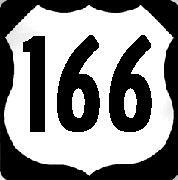 166 is broken down by county below.